Digital literature is still a relatively overlooked phenomenon – even if it is more or less as old as the computer and has had a lasting influence on the development of computers and networks ever since the computer was invented. Digital literature has continuously been part of IT developments, especially related to how we read and write (with) the computer and its networks. Digital literature develops, explores and teaches us how digital text is developing, from the different layers of the interface (e.g. the relations between text and code or reading and how the reading is captured) to networked texts (e.g. hypertext, WWW, social media, mobile media and search engines such as the Google platforms) and to relations between text and other modalities and media (sound, visual, space). In short, digital literature provides a way to explore, understand and further develop the way digital culture, its ways of reading and writing are formed. With recent discussions around ‘fake news,’ hijacked elections and the problems around data profiling, critical explorations of digital culture and text has become a central concern for contemporary democracy, education and libraries. Even if many visitors of a typical library public have not met digital literature before, most have been confronted with the ways our textual and literary culture is changing through e-books, search engines, social media and more. As documented in interviews from the project many visitors to the exhibitions recognize the ways our everyday digital textuality is explored through digital literature – many even see digital literature as an eyeopener on how online services such as Google and Facebook function and relate to contemporary discussions of ‘fake news’ or data profiling. There is an important overlap between the traditions and developments of the library and of digital text. One of the best examples of this is hypertext, which has developed from literary thinking in e.g. Jorge Luis Borges and ingenious reading machines and library forms developed both in monasteries in the 1500s, by the Belgian librarian and peace activist Paul Otlet in the early 20th century or by the American researcher Vannevar Bush immediately after the war. The inventor of the term “hypertext”, Ted Nelson wrote the book Literary Machines (1980) where he described his ideas for new and alternative ways of using the computer, and hypertext is indeed a sort of literary machine allowing for new ways of writing and reading. Digital literature has been important in developing hypertext, also before it became popular as the World Wide Web from the mid 1990s. When the Web was born, it became a natural home for digital literature and current platforms such as Google, Facebook and Twitter are also populated by digital literature. However, digital literature still needs libraries and libraries need digital literature. Turn On Literature demonstrates that digital literature is a way for libraries to explore and reflect on digital media, including a way to interact with educations, communities and other groups of readers. The project suggests that finding ways to open the discussions of digital media and textualities and including audiences in the reflections of the current challenges and changes of literary culture – including questions of authorship, literary quality, the spaces, limits and frames of the literary, etc. – is rewarding. This can even lead to using digital literature to discuss the actual and future roles of libraries. Judged by the project’s interviews and workshops it is remarkable that all kinds of readers reflect on question normally reserved to literature professionals in quite sophisticated ways. Furthermore, it is work noticing that audiences acknowledge and recognizing the quality in the exhibited works, e.g. pointing to the winner of the Turn On Literature prize, ABRA – A Living Text by Kate Durbin, Amaranth Borsum and Ian Hatcher and the three versions of The Poetry Machine developed in the project. The project in this way demonstrates that libraries can use digital literature to explore and reflect on digital media not only through tech workshops and maker spaces but also through digital literature and in this way point to how literature is continuously relevant in a digital age. All libraries showed exhibitions based on The Poetry Machine and a number of works from the Turn on Literature Prize competition where over 50 international works from leading authors and artists were submitted. In Bergen the main exhibition was part of the larger event of the 100th anniversary of the library which included local politicians and many visitors. Bergen also organised smaller exhibitions, talks and workshops with educations etc. Roskilde curated a big and ambitious exhibition with more than 20 works, a catalogue, talks, tours, workshops in collaboration with educations etc. Besides focusing on the curating both in the physical library space, online, through advertisement and social media and through the printed catalogue, Roskilde and Bergen point to educating the library staff to serve as guides and make contact with the visitors. Both libraries also point to how digital literature works well with educations who need to teach digital media and critical thinking which digital literature supports both thematically and through its use of technology. Besides digital literature also makes traditional literature interesting in new ways and helps opening the eyes of students who are less interested in poetry. The Antim Ivireanul Valcea Library offered workshops and guided tours in relation to their exhibition which was the first exhibition of digital literature in Romania and promoted through local media, newspapers and TV. Even if it seems that Antim Ivireanul Valcea Library made smaller events and exhibition, it has to be taken into account that this library had less experience and resources. 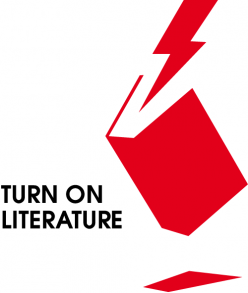 All in all, Turn on Literature has resulted in outstanding national exhibitions in Norway, Denmark and Romania that have also been acknowledged internationally by the exhibited and invited authors and through presentations at the international conference by the Electronic Literature Organisation in Porto 2017. As part of the project, three authors, Radu Vancu, Morten Langeland and Ursula Andkjær Olsen have created new versions of The Poetry Machine installation in Romanian, Norwegian, Danish and everything is translated into English. The Poetry Machine has been an important part of the project and has been recognized by audience members in interviews and workshops. It’s relevant to point out two aspects in relation to the Poetry Machine that are however also relevant broadly in relation to the other works and illustrate the potential of digital literature. One is related to how digital literature and the Poetry Machine reflects current experiences with reading, writing, literary creativity and making sense, the other is related to translation and software. A young high school girl from Roskilde (Sofie), who also writes poems herself, is in an interview very enthusiastic and talks about how the interface of The Poetry Machine with its sea of words, its use of books and simulated paper sheet entices her poetic reading and writing process in its way of emulating her creative mental processes: “I think it looks very cool with the sea of words, like a stream of consciousness – a lot of thoughts flowing by in a human way, like it’s your own mind. And when you read them they become part of your mind (…), and then the visual paper appears, which gives you the impression that you’re writing yourself. (…) I liked the idea with the three books, which gave the impression of three different aspects of the world that you can chose from. (…) I also liked that one can chose which sentences to add and that they are repeated. It gives you different aspects of literature (Interview with Sofie by Roskilde Libray, translated by Søren Pold).” Otto, another high school student from Roskilde Gymnasium compares ABRA with cut-up poetry, which they have tried in class and he also points to the fact that you get a print-out from the Poetry Machine. Both of them as well as others e.g. a group of older users, acknowledge and appreciate the high quality level of the exhibition, including the forms of interaction, though the older users also mention technical challenges. The author of the Norwegian poetry machine, Morten Langeland, talks about the way that he has given up the composition or dispositio part of the poems to the readers, which leads him to work with found sentences collected from newspapers, radio, books, film, signs, advertisement and he even asked colleagues to provide him with sentences. Furthermore, he plays with pronouns like “I” and “you”, that are empty markers in the text and not filled before they come “out of the machine and can be read out loud.” Consequently, the Poetry Machine is used as a poetic way to reflect on the experiences with language that we have on a daily basis when interfacing with Google and Facebook. We experience that our personal language, intentions and choices become depersonalized data and the Poetry Machine becomes an interface to re-poeticize and play with this in a process that sometimes even creates valid literary poems. Or as Langeland observes: “Were the poems good? Well, some. Is it important in a project like this? Well, the most important thing is perhaps rather to spread the feeling of creating something. Give some ways to wake an awareness around formulating and expressing.” Several users acknowledge this and the ways it informs their understanding of literature, poetry, new media and their own writing. Ideally The Poetry Machine becomes a machine to play with, explore, gradually understand and even poeticize the way language, reading and writing is treated in contemporary digital media – perhaps even suggesting alternatives. Concerning translation, the second aspect worth highlighting, the different languages and translations of the Poetry Machine has helped to create an interesting dialogue across Europe and across relatively small European languages, which emphasizes that the many languages and cultures are an important part of European identity and literature, including also digital literature. Each national literature is in a deep relationship to its traditions and language, and the project has pointed to the importance of translation for understanding and appreciating this. Besides exhibition and presentation, libraries should be important places for archiving and preserving digital literature, including translating it to new languages, platforms and software. A European project like Turn on Literature demonstrates the importance of this and the value of translating and creating connections between the many different European cultures and languages. It has provided a path for future work with collecting, exhibiting, distributing and translating digital literature both nationally, on a European scale and internationally. The exhibitions showed international and national work, which was appreciated by the audiences. However, the fact that The Poetry Machine with this project becomes a platform for more than a handful literary texts in different languages and translations into English (and French with the recent work for ELO 2018) was not sufficiently clear to the audiences that mainly explored the local versions. In the project there were discussions of how to include and show the other texts, languages and versions of the Poetry Machine, but we did not come up with good ideas that would not disrupt the rather simple interface and the strong focus on the physical space and interaction of the installation. However, developing and interfacing the platform aspect of The Poetry Machine would be relevant for future projects, including the opportunity to work with more languages and translation as part of the literary experience. Translation in and with software has increasingly become relevant and digital literary translation can contribute to a more general understanding of translation in software and interface platforms. Interfaces currently translate us through profiling and we translate them when we interact with what the interfaces produce through this profiling – and more focus is needed on understanding this translation and what it means in the time of social media and culture industrial platforms such as Amazon and Spotify. Digital literature can be used as an artistic experiment in understanding software translation – how we translate software in our work and culture, how software itself translates work and culture, including how our action and interaction is translated in profiling etc. The field of literature includes a knowledge of translation as a literary cultural and more than technical practice, which could be useful when translation is increasingly managed and done through and with software. The printed book is not disappearing, but literature is changing and taking part in the many interfaces of digital media. The library is needed as a space this, for demonstrating, presenting, and developing critical reflection. Libraries are an important part of European cultural, literary traditions and education and Turn on Literature has indeed demonstrated that libraries can still be great spaces for this in a digital age. The project has been hosting exhibitions with more than 100.000 visitors across Bergen, Roskilde and The Antim Ivireanul Valcea County Libraries, which might be some of the most ambitious and most visited exhibitions of digital literature ever. Furthermore, the project has demonstrated that digital literature can be used to develop critical competences among the library audiences in relation to digital media, which is a growing agenda under terms such as computational thinking and digital literacy, and it seems obvious for libraries to play a major part in this. The project has developed important experiences and models for curating and locating new work, including the prize competition. This is an amazing and valuable effort definitely worth continuing and developing further. FRITSCH, J., POLD, S. B., VESTERGAARD, L. S. & LUCAS, M. 2014. Ink: designing for performative literary interactions. Personal and Ubiquitous Computing, 18, 1551-1565. MENCIA, M., POLD, S. & PORTELA, M. 2018. Electronic Literature Translation: Translation as Process, Experience and Mediation. Electronic Book Review. POLD, S. & ANDERSEN, C. U. 2018. The Metainterface: The art of platforms, cities and clouds, Cambridge, Massachusetts. London, England, MIT Press. RETTBERG, S. 2018. Electronic Literature, Cambridge, Oxford, Boston New York, Polity. Søren Bro Pold has been doing research on digital literature for more than twenty years. He is co-researcher and evaluator in Turn on Literature and has worked with Roskilde Libraries in several earlier projects, including the continual development and design of the Poetry Machine. During Turn on Literature he has been included as a consultant and evaluator and as a jury member in the Turn on Literature Prize competition. In relation to the projects he has published research, including POLD, S. & ANDERSEN, C. U. 2018. The Metainterface: The art of platforms, cities and clouds, Cambridge, Massachusetts. London, England, MIT Press, FRITSCH, J., POLD, S. B., VESTERGAARD, L. S. & LUCAS, M. 2014. Ink: designing for performative literary interactions. Personal and Ubiquitous Computing, 18, 1551-1565, MENCIA, M., POLD, S. & PORTELA, M. 2018. Electronic Literature Translation: Translation as Process, Experience and Mediation. Electronic Book Review. His background for doing this evaluation is besides general knowledge as researcher his participation in meetings and workshops in Roskilde and Ramnicu Valcea, his participation in the Electronic Literature Organisation conference in Porto 2017 where the Poetry Machines were exhibited and the Prize announced, and his visit to the exhibition Wild Forms of Literature in Roskilde. He has visited Bergen Public Library on earlier occasions but not during this project. Material for the evaluation has furthermore been provided by the libraries, including videos, interviews and reporting. Digital literature is also called electronic literature. For a good introduction and overview, see RETTBERG, S. 2018. Electronic Literature, Cambridge, Oxford, Boston New York, Polity. There is less material available on what was offered and how it was received in Romania and even though I participated in a meeting and workshop at the library, it was not during the exhibition period. The Danish version written by Ursula Andkjær Olsen uses the pantoum format, which is a Malaysian form of folk poem where lines are repeated and interweaved in a specific pattern. For more on digital literature and translation, see MENCIA, M., POLD, S. & PORTELA, M. 2018. Electronic Literature Translation: Translation as Process, Experience and Mediation. Electronic Book Review. Previous Previous post: How to work with electronic literature? Read here!